We no longer carry the 1996-04 Mustang Pacesetter Long Tube Headers, 1 5/8" Primaries, 3" Collectors Armor Coated GT 4.6 2v. 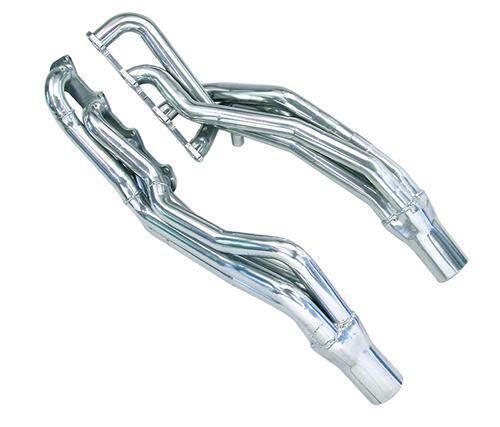 Check out 1994-2004 Mustang Headers for an updated selection. Improve the performance of your ride with these PaceSetter headers. Manufactured from mandrel-bent, mild steel tubing, they feature thick steel flanges that are surface-ground for a leakproof seal. Looking for more power from your 1996-2004 4.6L Mustang GT 4.6L 2V? Now you can improve the performance of your SN-95 Mustang with these PaceSetter long tube headers. Manufactured from mandrel-bent, mild steel tubing, they feature thick steel flanges that are surface-ground for a leakproof seal. These PaceSetter long tube headers are finished with a durable ceramic coated finish. These PaceSetter long tube headers come with hardware and gaskets,as well as illustrated instructions to help with installation.